Happiness! 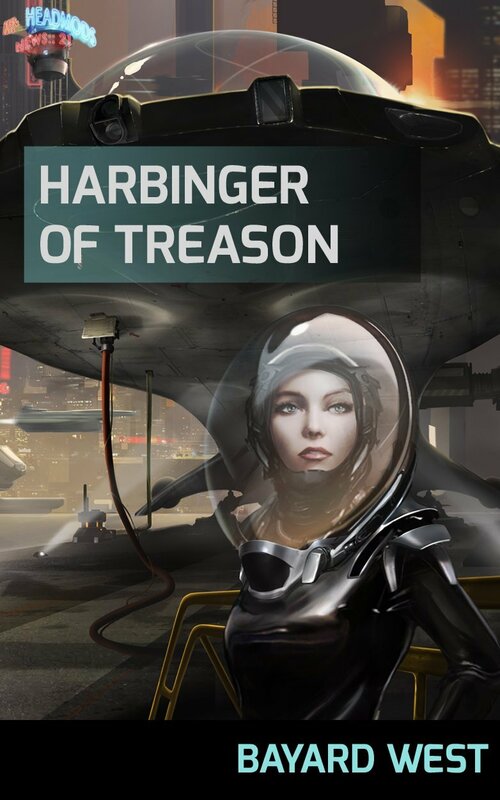 I’ve received my copy of Bayard West’s beautiful novel Harbinger of Treason, which I was lucky enough to work on as a line editor. It’s fast-paced science-fiction with a bit of everything: adventure, romance, suspense, beautiful visuals, and characters who are as complex, endearing, and fallible as people in the real world. I knew from my first preview of this book that it would be something special. Bayard West has that kind of confident and precise writing style that seems effortless (although of course it’s not). He uses short, vivid sentences to create a rich world in small brushstrokes, and leaves enough story hidden just below the surface so there’s always tension, subtext, and the potential for surprise. You can check out a sample of the first few pages over at the Amazon.com preview. Harbinger of Treason is set in the future, with roiling planets as scenery and our own time as a cultural backdrop. Humans are now space-farers who have adapted to using biotech implants for their social networking and self-expression. Cassie, the main character, is a talented starship pilot with a painful past and a knack for getting herself into trouble. I loved the dynamics between her and each of the other characters. All of the characters in this book have their own histories, motives, and secret desires, so you get a sense they’re all very real people — even the AI have unique and believable personalities. It’s a brilliant page-turning read and reminds me again of why I love my job: it’s so exciting to see new authors publishing imaginative stories of this quality. And how beautiful is the cover! Illustrated by Lazar Kačarević at Sugarbricks.com. Disgraced starship pilot Cassandra Hague must save her friend from a form of extortion – one that has left his brain implant fatally sabotaged. Time is short, and the only doctor who can cure him lives on a distant outpost deep in enemy space. Cassie has no choice but to take the fastest starship she can get her hands on and head for the outpost, even though stealing an advanced prototype ship is bound to attract the wrong kind of attention. She soon discovers that the Sol Alliance government will do anything to safeguard the secret tech crammed into that ship, but – even worse – they are not her only pursuers… A psychotic artificial mind with a strong interest in the stolen tech noticed her fleeing the solar system, and now she has become its prey.